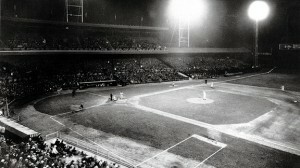 The first night major league baseball game is played in Cincinnati. The hometown Reds defeated the visiting Philadelphia Phillies 2-1. Night baseball caught on around the league very quickly – except for the Chicago Cubs, who didn’t play a home night game until 1988. Why am I not surprised?